A mix of fresh herbs and a blend of tangy cheeses on roasted garlic oil for a light summer pizza. Sometimes, when I put basil leaves on a pizza, they seem sort of dry and forlorn after baking. For this pizza I spread plenty of roasted garlic oil on the crust to try and counteract this issue, and I believe it worked well. I had both crumbled feta and crumbled goat cheeses in the cheese drawer--an embarrassment of riches if I don't say so myself--so instead of dithering between the two I used some of each. 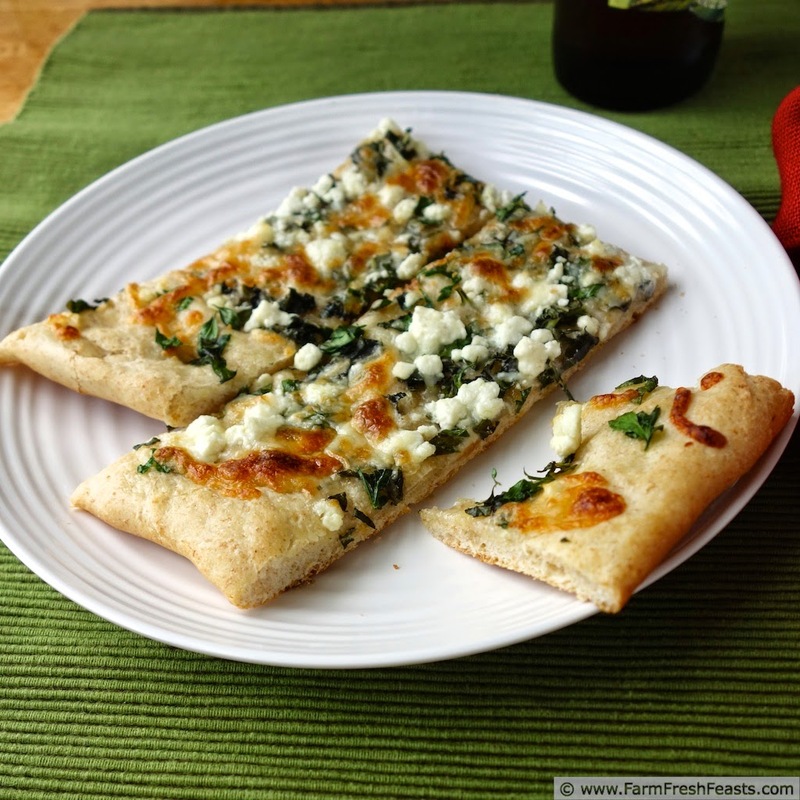 The result is a pizza that tastes a bit like amped up cheesy garlic bread--fresh flavors, vibrant color, but a familiar taste [even if my daughter wasn't initially sure about the giant pile of green leaves on the pie]. For more pizza recipes, organized by category, like vegetarian pizzas, pizzas with seafood, savory pizzas with fruit, please see my Visual Pizza Recipe Index. 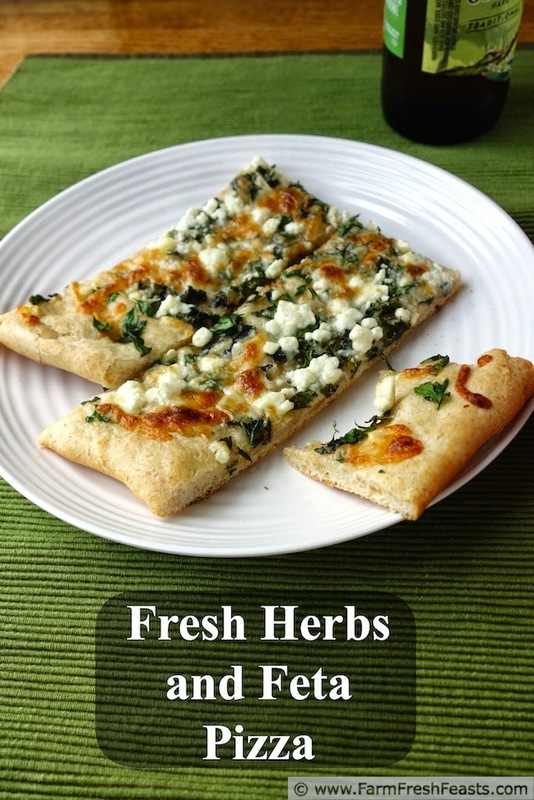 For more recipes using a lot of herbs, please see my Recipes To Use Up Herbs Collection. It's part of the Visual Recipe Index by Ingredient, a resource for folks like me eating from the farm share, the farmer's market, the garden, the neighbor's garden, and great deals on ugly produce at the grocery store. For general directions on making pizza crust, please refer to my Pizza Primer post. In a small bowl combine olive oil and smashed garlic until blended. Spread across prepared dough. Scatter chopped herbs across the top. Top with cheeses, and perhaps a grind or three of pepper if you like. 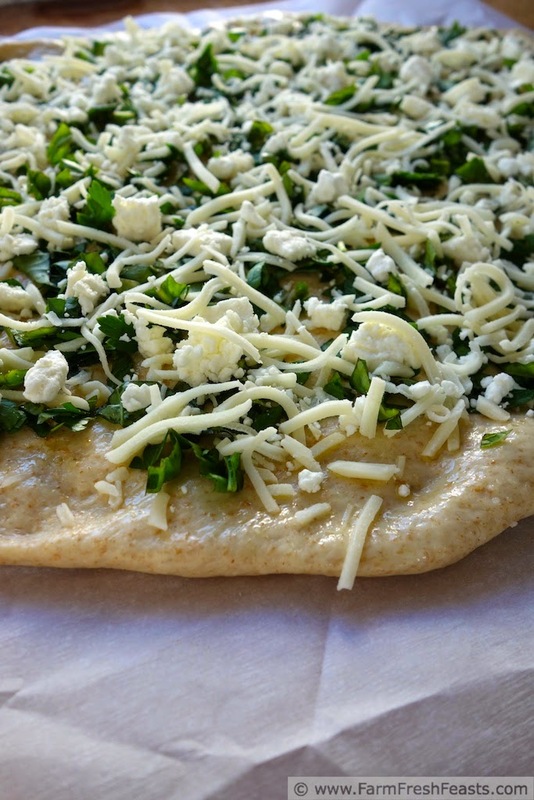 Bake for 5-8 minutes, then slide the parchment out from underneath and bake directly on the pizza stone another 3-5 minutes until cheeses are browned. Slice (Amazon affiliate link to my beloved pizza slicer) and serve. 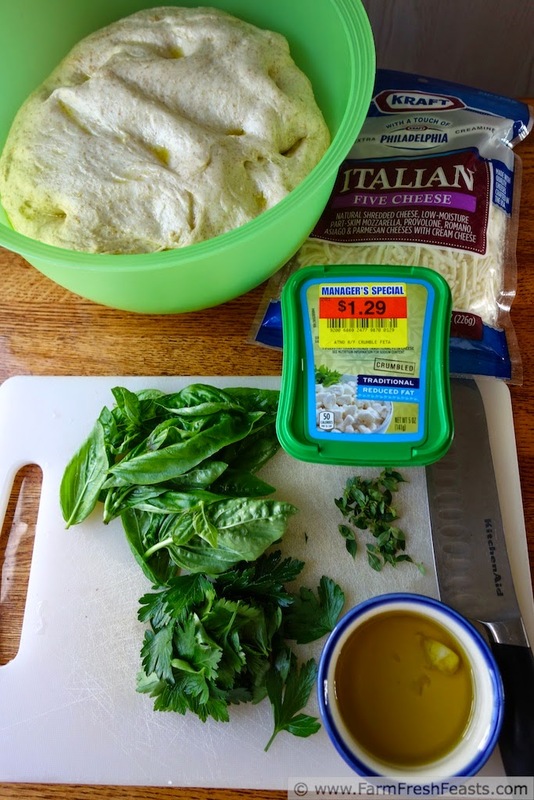 I often add the herbs on after the pizza is cooked, to avoid the wilting and browning. I've trimmed my new little basil plants down as much as I can, and now have to wait for the next leaves to grow. I love this time of year! 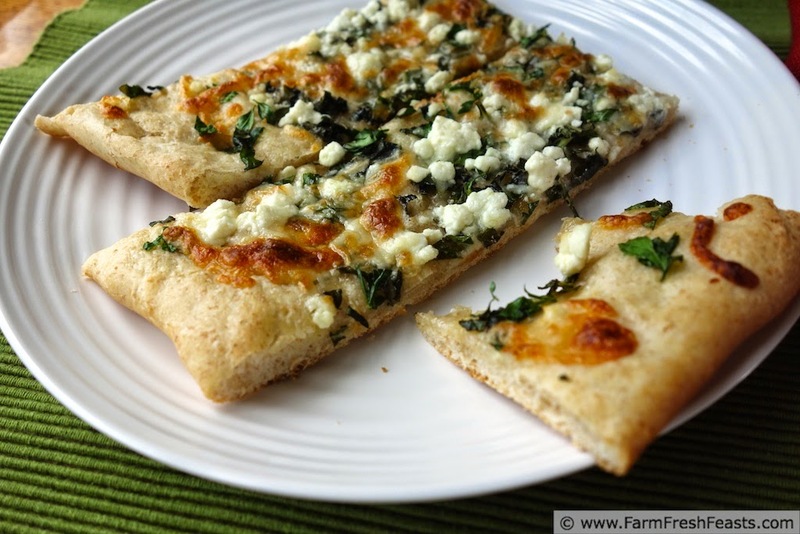 That's a great idea--adding after baking--I do that with celery leaves and Buffalo chicken pizza. I would like to say I'm jonesing for basil, but in fact I'm not. I won't plant my basil until after I harvest my garlic (I use the same bed to get 2 crops, one garlic and one basil). It's true I could have basil earlier, but I won't have tomatoes anytime soon so there's less of an impetus to get the basil going. I do love this time of year--each time I walk out to the garden I see changes! Pretty sure I could eat this for lunch every day... Looks fantastic! I could probably eat pizza--of some sort--for lunch at least once a week, but every day . . . well I'd miss beet greens and grilled cheese sandwiches and bagels with lox and cream cheese, so I don't think I could eat pizza every day! Oh, that looks so good! I love pizza - especially when it's light and healthy without heavy or greasy meats and such - though you won't see me turn down a piece of pepperoni pizza! :) I have a bunch of oregano going crazy in my garden right now, I wonder if I could substitute the parsley and thyme for the oregano? Thanks for the recipe and the inspiration! 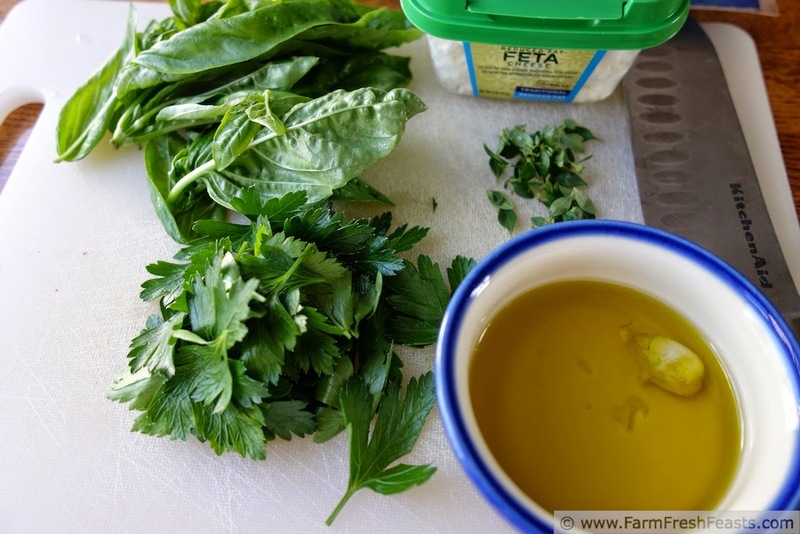 You very easily can sub oregano for parsley and thyme. I got a big wad of savory in the farm share yesterday and will be trying that on a pizza this weekend. I love the gif. Seriously very helpful to see how to correct the dough. I also have trouble with the basil burning and usually add it just as I'm taking it out of the oven. I'll try your method next time. I want in on the cheese wealth. You have the most awesome cheese stash I've seen. I can't imagine the goodness you're getting up to with your pizzas. As for the gif--thank you. It was not exactly easy to hold the dough and take the photo and return the whole thing to the mixer and so on and so on, but I thought it would help so I persevered.